Sutton's third birthday was June 9th. This play kitchen was what I made for her. She calls it her "chicken", meaning kitchen. 1. Took the doors and the back off and removed center wall/support. 2. Re-enforced the unit with some 1x2's and 2X2's and plywood for the back. 3. Cut the hole for the sink. 4. Cut the hole for the window in the oven door. 6. Added filler pieces under sink and beside oven. 7. Drilled holes for stove and oven knobs. 8. Replaced decorative piece on bottom because it was ug-ly! 9. Used wood filler in grooves on dishwasher door for same reason as #8. 13. Painted stove and oven and doors for oven and dishwasher with "Aluminum" spray paint. 14. Painted counter and back splash area a glossy white. 15. Spray painted yogurt and formula lids for stove burners black. 16. Put it all together- glued on window picture (thanks mom and dad for the print! ), installed window trim, installed sink, attached knobs and burners, attached hardware to doors and installed doors (hinges added to the bottom and magnetic closures on top so doors open the same way ovens and dishwashers do), attached pot rack. 17. Sewed and installed curtains. I still need to caulk and touch-up paint the window. This was such a fun project for me. It was a big one! It was the first time I have used power tools (like the table saw) on my own. The first day I worked on it (taking it apart and reinforcing the structure) I was lucky enough to have my mom visiting. She has been building/creating all my life. If she wants to make something and doesn't know how, then she teaches herself or makes it up as she goes. She is a great inspiration to me! Surprisingly, this was the first time we have worked on a project together. It was a great experience! The total cost was approximately $65. The entertainment center was $20- craigslist. The sink and faucet $15, knobs $4 and blue paint $4- all from the Habitat for Humanity ReStore. I tried to use things we already owned- handles, fabric, pot rack, window trim. About another $25 for plywood, magnetic closures, spray paint, nuts, bolts, washers, plexiglass etc. It's been a huge hit! The girl loves her new kitchen. My six year old boy thinks it's great fun too. I knew it!! As soon as you gave me the hint that it was something for Sutton, I guessed. :) This looks amazing though - you did a great job! Your kids are lucky to have such a creative mom! This is Amazing! Meg sent me a link to your blog. So Cool! You've totally inspired me. erin-- that completely blew my mind! WOW. i seriously can't stop thinking about it. i'm here in NYC and i just showed it to my sisters-in-law and they cannot believe it either! now i KNOW you are the right person to help me with my project for k & b's room! i CANNOT believe that you made that kitchen! you are amazing!! it turned out PERFECT! I also just found your blog and this kitchen is amazing!!! Thanks for sharing this wonderful project! What a fabulous idea! My favorite part is that it's totally customizable. I'm totally going to try something similar when Norah is older. :) Great job! Wow, that is amazingly clever and adorable...I would've played with that for hours. You did a beautiful job!!! I'm dying inside, this is so cool! Wowza! She'd better love that til she's 30! WOW! haven't checked you out in a while- glad I did, this is such a great idea, I may steal it :0) great job. This is brilliant! The best "chicken" reno I've seen in a long time! I'll bet she loves it! With 19 plus comments you gotta know what you did was INCREDIBLE!!!! Your daughter will remember that forever, because what little girl doesn't remember her first kitchen?! Way to go! What a wonderful project! I would also like to make one for my twins for their second bday next year. I just don't know if they'll be tall enough. My mom has an old entertainment center that's just sitting around. I'll have to measure it and see. Thanks for the post! I'll be following you now! I also just found your blog by way of Just A Girl. This play kitchen is amazing!!! Very creative!! Thanks for sharing this awesome project! Amazing job, how creative you are. Good Job! Wow! That was a big project with a big result! That is adorable! Great job. You're really talented! Love it! What great vision you have - and then to be able to execute it - fantastic! It is adorable!! I'm speechless!! This is soooo amazing! My daughter's just 13 months old but when it'll be time to those kind of play I'll consider making something like that! I am so impressed! What a great idea. WOOOOOOOW! That is so great!!! Is it ok for me to link to it from my blog??? Wow! This is amazing! What a great way to reuse and create something truly fabulous! That's phenomenol. Wow! Great job! This is amazing! I just want to stare at it!! I just found your blog from U Create. This kitchen is AMAZING!! That is so adorable! You did an awesome job. Hi there, i was just browsing people's blogs and found this. That is absolutely amazing!! This is total upcycling to the max! And the picture of the woods gives it such a perfect touch. This is AMAZING!!! If I had the room for something this big I would be copying this idea. I think my little girls would flip!!! Great job and thanks for showing how you did it. This is adorable..and absolutely amazing how you came up with this idea!!! SUPERB!! I can't stop staring at what you did. :) Thanks. Incredible! Your first time with power tools?? Amazing!! You're an inspiration. Thanks for sharing all the details. It looks so much like a real kitchen. What a great idea. Sure beats anything you could buy at a store. I LOVE this idea! I really hope you don't mind if I share it with my readers. That is fantastic! Wow, incredible re-do. Love it! Amazing! I saw on Just a Girl and was jealous! I'm featuring this on Somedaycrafts.blogspot.com in a couple of days. Thanks! Grab my "featured" button! Ho-ly cow. I am in awe. That is incredible. That is amazing! What a very, very clever idea. Now she needs some of that adorable food that I see moms all over bloggyville making for their kids. I just love this! You are a Genius. I love Love LOVE this! Found this through a link on a friend's blog (Minnesota Mom). What an AWESOME idea! I love it! I wish I would have seen this before we got rid of our old entertainment center and I bought a toy kitchen set for my daughter! Can I come play? Seriously awesome! Oh my goodness, that seriously is the coolest thing I have EVER SEEN!!! I'm really sad that I don't see a subscribe button on your site :( How do I subscribe? You are amazingly creative. I absolutely love the kitchen. All I can say is Wow! that's incredible! what an amazing project. Wow! I wish I'd seen this before I bought the over-priced plastic one. Wow! This project rocks! Thanks for sharing your talent. I love it! I would have never looked at an entertainment center and thought kitchen! wow this is amazing! you have one lucky daughter! that is amazing. i'm kicking my self for buying the $270 plastic kitchen from toysRus now. way to go. WOW!! You did a fabulous job, it's absolutely amazing! That is awesome! What a lucky girl!! Wow! This is sooo creative, I love it! I'd also love to link to this if you didn't mind! wow! what an awesome job you did. Sutton is a very lucky girl! I LOVE THIS! and LOVE the color - smashing!!! WOW!! Wouldn't this make a fabulous Christmas gift, too? My daughter would sooooo love something like this. I wonder if I can talk my hubby into creating a similar one? Amazing. I hope you don't mind if I feature this idea? What a great inspiration you are dear!! I love this one!! And so will my granddaughter!! I am adding you to my list of favorites so I can come back often to check out your blog! I have thoroughly enjoyed reading yours today. I hope you have a very blessed day dear. That totally freaking rocks the party. LOVE it. I love it! It's such cool idea and you did an awesome job! Wow!! You are very talented and creative. I posted a link to this on my blog today. That is absolutely BRILLIANT and a.dor.able!! Great job! just think how much you saved by not buying the pottery barn version. and, just think that your kids will enjoy it so much more because you made it! Love love love this "chicken". Great job! I hope you don't mind that I have linked to you from my blog post about your awesome play kitchen! I found you through Ohdeedoh! I am beyond impressed! I may never ever say that I am crafty or slightly crafty again :) Great job. This is amazing! I hope you don't mind I linked to you from my blog and added your project on my sidebar. I love this!!! I'm going to have to do this for my daughters!!!! Look at all the comments!!! You ROCK!!!! That is so so Cute!!! Too bad my daughter's 14! You deserve an award or something! I'm showing this to my husband and begging him to help me make one for our daughter. Great job! I am blown away by this project! How inspiring. It is truly amazing--great job. that is seriously amazing. Way to go! Wow. That is awesome. You did such a great job. I LOVE the addition of the picture window - brilliant! This is amazing! I wish I was brave enough to attempt such large projects! Amazing and clever! I immediately showed my husband, and can tell he's already thinking about how to adapt this idea for our toddler. Great, great work, Erin! Great job! That is awesome! Wow so happy to have found your blog. You are a amazing! I can't believe it's an entertainment unit! Bravo!! this is so brilliant and stunning I don't even have words. you better bet I am hopping over to craigslist right now. I am sooooo over the crummy plastic play kitchen. I really, really want to make one of these! Wow, that is really fantastic. Wow! That looks fantastic. I saw the link to this on one of my blog subs. It is amazing! I have been thinking of making one for my dd for Christmas this year, and you've really inspired me. I'm totally going to email this to my father-in-law, and see if he'd help me. just wanted to let you know I shared your great idea on my blog today- thanks for the inspiration! Seriously! very creative and it looks so professional! Okay Erin, so I was just on sugardoodle and I was looking at this post...thinking wow....this sounds exactly like the kitchen Laura described to me that you made....and SURE enough...it was YOU!!! This is AMAZING!!!!!!!! You are fantastic!!! Best Redo yet~ totally impressed! This is unreal. Or should I say so real! I love this! Way to go. What creativity...I love turing junk into treasure....this is such a great idea. WHOAH! You are amazingly creative! I have two school age boys & this seriously made me want to try for a girl! Erin, I can't believe I found you this way... I was on Sugardoodle and I saw your name and clicked on this... I don't know if you will remember me, Natalie Broadbent, formerly of Brooklyn! It has been a very long time since I have seen you. Your kitchen playset is amazing! I hope you are doing well in North Carolina! We are in New Jersey. Take care! I hope you do not mind I posted this idea to a message board I go to. What a super idea! You should think about going into business and selling them. I'll bet you could make a nice profit and the more you made the quicker they would go together. This is fabulous!! My mind is spinning away to make such a crafty creation. Great blog! I am enjoying checking out your blog. AMAZING!! All I can say is amazing! This is great! I love how realistic you made it with "stainless steel" appliances and a window looking out onto a beautiful landscape. If I may, I would love to link to your post in my blog. Also, if I may suggest, post the instructions on Instructables.com. It would be a great place to share this. This kitchen is so cute! Can you tell me how wide the entertainment center is and where did you get the sink; is it a real sink? shannon- the unit is 50Wx49Hx16D. great work!! i love it! That is amazing!! I think I might have to do something like that for my daughter when she gets older! Thanks for the inspiration. We found a freecycle smaller armoire style unit and are beginning the re-purposing tonight to set up in our home-school classroom. I loved your idea so much!! My husband and I did this for our 3 girls as a Christmas present this year and they love it!! Thank you!! This is so cute! I sure wish my girls had the space for one in their bedroom. You're great, thanks for the inspiration! Wow, wow, wow. This is unreal. That kitchen ROCKS! And my daughter also calls it the 'chicken'. I love your play kitchen! I am starting my own project to repurpose a nightstand into play kitchen and I linked your post and one of your photos on my blog. Hope that's ok! You should find the entertainment centers for free on free cycle and make them to sell. That is awesome and looks so much nicer than most of what you can buy. I love this Play Kitchen idea. I'm in the process of finding the center for my little girl & plan on using your idea. I hope you don't mind I copied a photo and your link on to my blog. Thanks to the inspiration! love love love this! Im going to run with this idea for my daughter...thank you for providing an alternative to purchasing a super expensive one! WOW! That is so amazing! So creative! What a great idea--I love it!!! Thanks for sharing!!! This is brilliant! I will keep this project in mind for my little one when he starts getting bigger. Thank you! That is amazing! My 5 year old is looking at her small stove and is not impressed. FANTASTIC!!!! I could say it again but really, you have no idea how wonderful it was to "stumble" on this... I have been struggling with the thought of buying an expensive wood kitchen for months. My handy-man dad is visiting next week and will need a project (especially since the kids nap for 3 hours every afternoon)... You are my angel! Thank you for sharing this! I love it. Just linked to you on my latest blog post. absolutely amazing. very ingenious. happy birthday to your daughter, i'm sure she'll have many many hours of wonderful play in this beautiful space. I am in awe. That is a wonderful piece of work. I am completely inspired by your play kitchen. I actually used to have that same entertainment center years ago, and boy do I wish I would have had your vision to re purpose it. I couldn't see the diamond in the rough with this one. This is such an amazing idea, with wonderful execution! As the mother of a 3 year old, I can totally envision the fun. 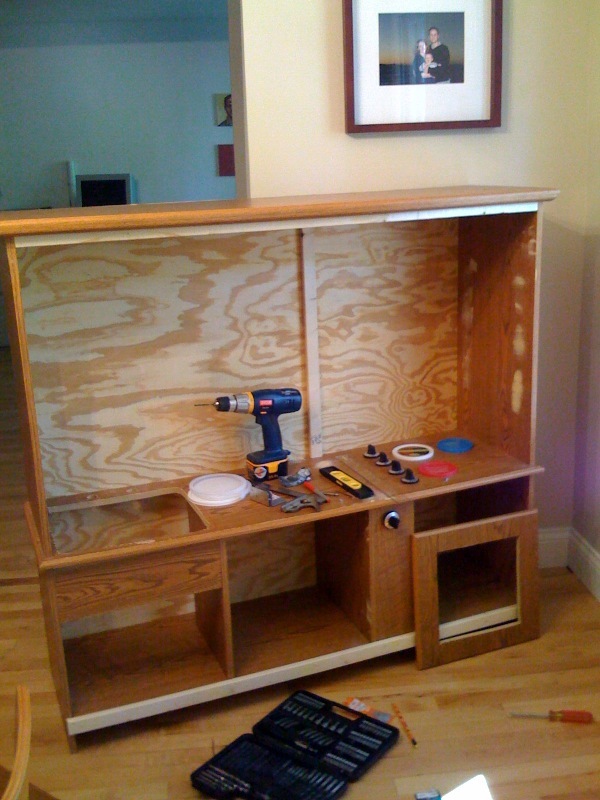 I can easily see possibility in unique, funky, flea market finds but to see the future of an MDF entertainment center is sheer brillance. Thanks to Rhythm of the Home, I didn't miss seeing it. Thanks for sharing!! WOW what a fantastic idea! You are very handy and what great way to recycle! Great job mama! My cousin sent me the link to this kitchen and I love it! I also love spray paint and refinishing furniture. Your blog is so full of great ideas! So glad I found it. Oh. My. Gosh. This is the coolest project! I am totally impressed! WONDERFUL! After my own heart! Cheers to you! Pretty incredible! The aluminum really looks real. I can't believe it was just spray paint! What a lucky little girl! You did a WONDERFUL job! It is fantastic and such a great way to re-use old furniture! This is totally ingenious and awesome! I LOVE IT! It is so cute!You did a fantastic job! very impressive. I wish more people were creative like that. Definitely impressed this reader! Nice job! 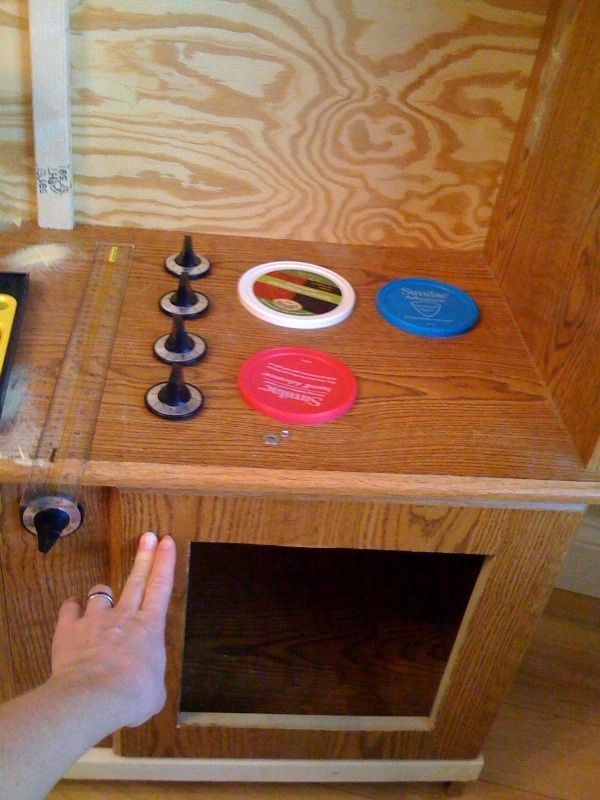 Very great comments shared about this blog post "A repurposed play kitchen". That would be very great to hear. Really awesome comments discussed about the blog. Thanks for sharing a very good blog about kitchen. Inspiring! I got the Entertainment Center. Now I just need to follow through with the rest of it. When I get it finished I will leave a link. Oh my Oh my oh my oh my...AHH! I love this! I literally lost my breath when I saw it! I am SO excited! I have the PERFECT spot for it...now I shall creep through Craigslist and find the right sized item...ooohhh I'm so excited! Thank you!! I love it! I also love spray paint and refinishing furniture. Your blog is so full of great ideas! So glad I found it. LOVE this! I've been looking for DIY kitchen ideas for my oldest daughter for awhile...will definitely be keeping this in mind, thanks! Your Kitchen Looks AMAZING!!!! I found you through www.marcandcaseyroberts.com. I posted a pic (with your link) on my blog post about what kind of play kitchen I want. Let me know if you are not okay with that and I will take the pic down. Thanks!! !